Hello fellow rockers! It’s Andy Gesner and the staff from HIP Video Promo bringing you a hot new clip from the deep freeze of Minnesota! Almost exactly one year ago, we predicted big things for Love In October. At that time, the Minneapolis indie rockers had barely recorded anything, they had almost no institutional backing, and no national reputation. What they did have was a terrific look, instrumental talent, a sure sense of the theatrical possibilities of music video, and a clutch of wonderfully infectious tunes. The clip for “A Day In The Life Of”, their first, announced the coming of a young band that knew how to use filmed images to advance their appealing musical ideas. Now, we’re no soothsayers, but we’ve got to say we’re pretty satisfied with the accuracy of our fortune-telling. 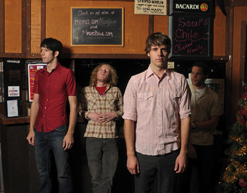 Since March ‘07, Love In October has released a well-received EP and a full-length, taken their sensational live show all over the nation, and dazzled their audience with more wildly-entertaining video product. The group has appeared on regional video shows JBTV and Fearless Music, played MTV and NPR, and won “Video Of The Day” honors in Paste Magazine. All this notoriety stoked anticipation for the band’s first album – so much so that when Pontus, The Devil, And Me finally dropped, it made an auspicious debut as the #7 add on the CMJcharts and received acclaim in Spin, Alternative Press, Kerrang!, and others. So what’s this new album like? The set pairs the urgency and reckless energy of radio-friendly punk with the sophisticated songwriting sensibilities of power pop auteurs. The band labels it “schizophrenic” in its exploration of contrasts – from poppy and nostalgic to fast and dark. CMJ calls it “maddeningly catchy”. The first single, and video clip, “Petrula The Destroyer” is piano-rock with a heavy emphasis on “rock”; eighty-eight keys bathed in reverb and powered by slamming, barely-restrained drums. It all culminates in one of the most infectious sing-along choruses we’ve heard this year, discharged with irrepressible verve by frontman Erik Widman. The clip for “Petrula The Destroyer” continues Love In October’s winning streak. Behn Fannin’s clever video is an engrossing piece of white-collar paranoia – and inspired and offbeat puppetry – that perfectly suits the song’s manic pace. “Petrula The Destroyer” opens with a shot of a harried worker in a crowded, low-ceilinged office that appears to double as a cell in a mental institution; meds drop through a slot above his desk. His mental destabilization is reinforced by Fannin’s choppy, fast-paced cutting, the deliriously shaky camera, and the washed-out, institutional grey-and-green color palette. Once the young worker takes his dosage, a puppet head protrudes from inside his shirt; this “friend” sings the lyrics of “Petrula The Destroyer”, and confronts its host with advice. The human and puppets attempt to flee, but wherever they turn, they’re confronted by the pill that keeps them in check. By the end of the clip, the wedding picture on the mans desk has been transformed, too; now even his girl is hawking medication. Is this all a hallucination, or is the “Petrula” clip exposing something about the modern workplace environment that’s all too true? It is our great pleasure to once again be working in tandem with Erik Widman and Carianne Johnson to bring you this must-see new clip. They’ve set us up with plenty of copies of Pontus, The Devil, And Me to satisfy all of your on-air giveaway needs, so please be in touch if you’d like to get your hands on some. If you need more info call Andy Gesner at 732-613-1779, or email HIPVideo@aol.com. You can also visit www.LoveInOctober.com to find out more about Love In October.